Now in paperback, the international bestselling romantic comedy "bursting with warmth, emotional depth, and...humor," ("Entertainment" "Weekly") featuring the oddly charming, socially challenged genetics professor, Don, as he seeks true love. The art of love is never a science: Meet Don Tillman, a brilliant yet socially inept professor of genetics, who's decided it's time he found a wife. In the orderly, evidence-based manner with which Don approaches all things, he designs the Wife Project to find his perfect partner: a sixteen-page, scientifically valid survey to filter out the drinkers, the smokers, the late arrivers. Rosie Jarman possesses all these qualities. Don easily disqualifies her as a candidate for The Wife Project (even if she is "quite intelligent for a barmaid"). But Don is intrigued by Rosie's own quest to identify her biological father. When an unlikely relationship develops as they collaborate on The Father Project, Don is forced to confront the spontaneous whirlwind that is Rosie―and the realization that, despite your best scientific efforts, you don't find love, it finds you. Arrestingly endearing and entirely unconventional, Graeme Simsion's distinctive debut "navigates the choppy waters of adult relationships, both romantic and platonic, with a fresh take ("USA TODAY"). 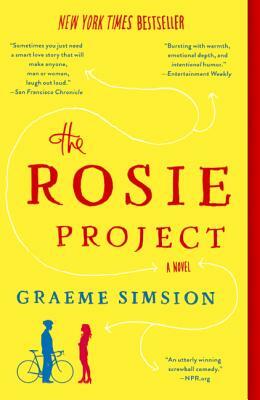 "Filled with humor and plenty of heart, "The Rosie Project" is a delightful reminder that all of us, no matter how we're wired, just want to fit in" ("Chicago Tribune").